Following my previous post, it has seemed to me that articles and advertisements about color have been everywhere. This of course is very exciting to me, and likely the rest of the fashion world as well. We in the northeast have waited long enough for spring! My family history of mild color perception issues reminded me that it was time to re-take a color test and see just where my own abilities fall. I wondered — could my self-claimed color sensitivity be wrong? Had it deteriorated with age? Myself and my co-workers had recently been discussing the test after that blue/gold dress internet debacle, so I sat down and took it again. It’s pretty neat — check it out for yourself right here. Look at that beautiful spectrum! Yep, that’s a perfect score. Hooray! 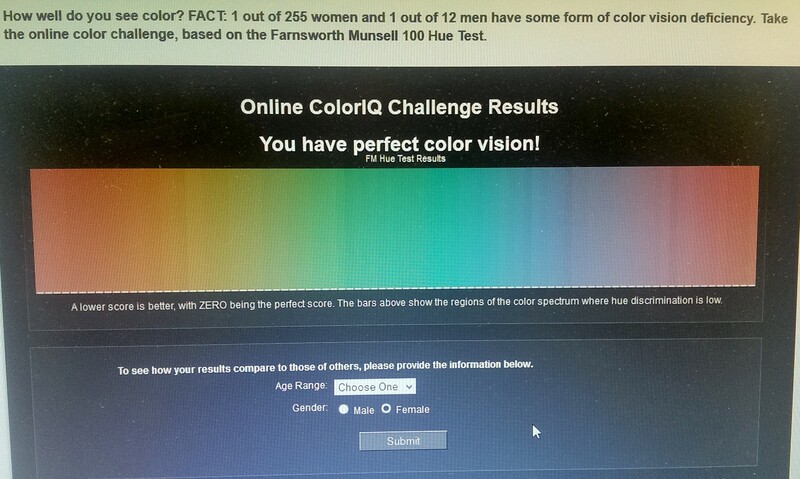 I’m not sure what kind of bearing this test has on my actual color detection abilities, but it certainly made me happy to know that my eyes and brain are in good shape. As my studies in gemstones and gemology continue, I will be interested to see how this test compares to my ability to grade stones and perceive minute variations in tint. (If I were a betting woman, I’d guess that my near-perfect musical memory is linked to this as well, since I get the same sort of “feeling” of wrongness when a note is incorrect as when a color is off.) Of course, there are many factors that have a direct impact on the way we individually perceive color, including time of day, mood, current trend, and even what color clothing you’re wearing at the time. Just think about how you feel when it’s pouring rain for three days straight, and someone walks by in a bright yellow raincoat. Now picture that same jacket on a sunny and warm day. Not nearly the same jolt of excitement, right? Context is obviously key, but it’s not limited to the person wearing the coat — you felt sad and grey in the rain, so the yellow stood out because your perception of the color was affected by your mood. So, tell me: did you take the color test? How did you do? Mmmmm. Verrrry interrresting! Add to tonal appreciation — visual & aural — the ability to discern patterns — visual & aural (& hidden ones) — and the ability to detect slight off- true horizontal/vertical. I possess all of these. According to neuro-phys. research it’s a combo of nature & nurture (ie: genetic predisposition & exposure & skill training). ¡Muy complicado! I love your musings. Btw, it snowed yesterday in CO and more is due next week! xox, Auntie L.